When Big Macintosh sustains an injury that leaves him unable to help during harvest season, Applejack is left to collect the harvest completely alone. Unwilling to ask for help and over-committed with tasks around the town, the increasingly sleep deprived pony attempts to stumble her way through her work for the week, but with so much on her plate, is she hurting more than she’s helping? Applejack-centric episodes are kind of few and far between (so much so that she’s jokingly been labeled a “background pony” by portions of the fanbase, although this first season is more even-handed with the six than future seasons will be she still falls somewhat behind the others in attention), so it’s interesting that the first episode to zero in on one of the six (aside from Twilight, of course) gets given to her. What I really like about this episode is how it very early on highlights just how understaffed the farm really is and hints vaguely at something that’s been more or less confirmed by Word of God but hasn’t ever (and likely never will) be any more than implied by the show. With the family matriarch far too old to help with the actual harvest (although Granny Smith does still very much have her place in the workings of the farm) and Applebloom too young to really contribute much, the workings of the farm pretty much land squarely on Applejack and her brother. The big hole in the family that never gets directly addressed is the fact that there should be two other ponies there that aren’t. To be fair, there’s at this point in the series a big question mark over the subject of parents for most of the cast, and they’re all basically treated as adults old enough to be out on their own to the point of absent parents not really being a big deal (with one exception we’ll also get to see at least one parent of each of the other five by Season 3), but Applejack was specifically introduced as part of a family unit, and family is a major theme that the Apples (Apple Bloom will be equally concerned about it when she becomes a more prominent character down the road) are focused on, so the absence of what should be a major chunk of Applejack’s immediate family is somewhat hard to miss. This may seem like a bit of a tangent for me to go on (and it kind of is), but I think it makes for pretty decent context behind why Applejack is so focused on self-reliance both in general and specifically in regards to the run of the farm, and why she’s so reluctant to admit that she needs help to take care of it. We already know that she’s not above letting her friends take the reins on things when it’s appropriate (see episode 2), but when it comes to her livelihood it seems to be a different matter entirely. It makes sense when viewed from the filter of somepony who had to quickly take at least partial responsibility of keeping the farm afloat along with also getting a Promotion to Parent in the form of taking care of her little sister (which also goes a long way to explaining her over-protectiveness of Apple Bloom, which we’ll see a bit of here and there and eventually will get an entire episode devoted to it). Accepting help isn’t just a blow to her pride, it’s admitting that she’s failing to live up to the role that she’s chosen to take on. This is the part where I shoot my own over-analysis in the foot, because admittedly the writers didn’t actually know for sure what the status of Applejack’s parents were at this point, only that they were absent. The idea of them being traveling salesponies was floated, and the idea of them being dead was around as a possibility but not actually pinned down yet. To be extra fair, we still haven’t ever really had a hard confirmation one way or the other, but the writers have hinted awful hard at the deceased parents thing being the real deal by now, so it’s a mostly safe assumption to make. In any case, even retroactively it makes for a good foundation for Applejack’s behavior in this episode. And I just went on in super serious mode for a bit on an episode that is actually very silly. Soooo on to the silly. Applejack quickly deteriorates in both competence and in mood as her sleep deprivation gets worse and worse (which for anyone who’s dealt with pulling all-nighters and taking on lots of work with little to no sleep, is very accurate). She starts out just slightly loopy when she shows up to collect her trophy, and is even more so when she goes to help Dashie, but is otherwise still pleasant (even if Rainbow seems to have little in the way of patience with her). By the time she gets around to helping Fluttershy, though, she’s irritable and downright mean about the whole thing, which of course leads to the second stampede that bookends the episode rather humorously with the first one (and gives us a rather goofy Lion King reference, to boot). Also, if we’re keeping track of epic pony breakdowns, this arguably is the best we’ll get for Applejack until maybe Season 4. I feel like I should have more to say about this, but I can’t really think of more to add other than that it’s enjoyable to watch one of the more down-to-earth ponies get a turn at being a total goofball. Also Pinkie. I forgot to what extent she was completely oblivious to… well, everything this early on. She somehow manages to never once so much as glance at the horrific concoction Applejack is putting together while they’re baking. That said, I do really love her interruption during Twilight’s speech. It starts out looking like a totally off-topic (and somewhat self-centered) intrusion, but I take it more as her just being slightly off-step with everypony else in her thought process. She understands what she means, but in her excitement she forgets that she actually has to vocalize the entirety of her thoughts for it to make sense. The little moment in which she stands there making her mental gear-shift might actually be my favorite part of the episode. It’s definitely not the last time we’ll run into her way of thinking clashing with getting others to understand where she’s coming from, but this might be the most innocuous example of it. Also, speaking of the baked bads, someone actually went and made a for-reals recipe out of it (swapping the earthworms for gummy worms, thankfully, but otherwise actually keeping pretty faithful to what Applejack mistakenly puts into the things). Finally, mark this as yet another example in the argument that AJ should have been the element of loyalty. Overall, I really like this episode. I feel like I’m missing so much that I should be saying about it, but seeing as I deprived myself of sleep before writing this to better get myself into Applejack’s mindset, I guess this is all you’re getting from me this week. Now if you’ll excuse me, I gotta go help Pinkie Pie. So right off the bat, I’m going to echo Tessa’s “Applejack’s element should have been loyalty” comment with words straight from said horse’s mouth (har har): “The loyalest of friends and most dependable of ponies!” If Rainbow Dash doesn’t get her act together, AJ’s going to lap her. I’m also going to come right out and say that while Applejack’s stubbornness is a force to be reckoned with, it’s Non Impediti Ratione Cogitationis to the extreme except in a way that doesn’t even make for a good joke. I understand that she’s trying to prove to her big brother that her legs can keep any promises her mouth makes (a bit of sibling rivalry, perhaps) and that she’s proud of her aforementioned critical role in the success of Sweet Apple Acres, and I can certainly see her as somepony who would forego burning the candle at both ends and just outright chuck it into the furnace in order to get a job done. But why she does it at the expense of everypony around her and absolutely doesn’t realize it just kind of bugs me. She’s the most level-headed of the bunch by far… except when she’s not, at which point she’s a stratospherically silly pony, and nothing short of disaster can bring her back down to solid ground. We don’t get too many Applejack-centric episodes in the series, and when we do, they more often than not return to this silly stubbornness to the point of exhaustion. Writing for such a down-to-earth pony (pun intended; didja catch it?) is evidently extremely difficult to do well, and that’s a darn shame because Applejack is such a wonderful character. In my Best Pony pryamid she’s tied with Twilight Sparkle on the center tier (behind Fluttershy, of course), but if she were given a chance to truly shine she would probably overtake Twilight (thus making the Best Pony inverted-T, I guess?). 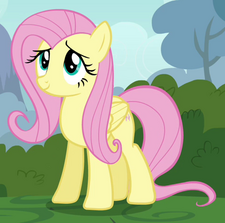 At least we do get to see her at her best pretty quickly when she diverts the stampeding cattle away from Ponyville. And speaking of that scene, this is the kind of yelling and screaming and window-shuttering (with a sound that is uncannily similar to a stock gunshot sound, no less) that I would have expected when Nightmare Moon showed up in Episode 1. That said, I can’t help but concede that Tessa’s “Santa Claus crashing the State of the Union Address” explanation of that confrontation makes a whole lot more sense: whereas a cattle stampede is a clear and present danger, a mythical figure showing up out of nowhere is… well, just confusing. You know what else is confusing? How this spread all over the internet. Which brings me to another thought: we’ve seen that certain species are relegated to “pet” status (Angel and Winona being the current exemplars), and now we see that other species, namely cattle and mules (and thus also donkeys), also exist and are “sapient” (for lack of a better word) in the sense that they speak and are, er, not the ponies’ pets. We’ll see other sapient species as the series progresses that are shown either directly or via implication to have their own societies, but we never really get that for the cattle or mules. In fact, we will get some clues that cattle in particular serve a similar role as we humans make them fill, which makes me wonder if they’re on the lower end of a sort of caste system. Or maybe indentured servitude. Slavery? Just overthinking? Probably the latter. Anyway, before I forget, this is the first time we get to hear Big Mac speak, and with one (maybe two, I can’t recall) exceptions we’ll never hear him say so many words again. Personally, I kind of like this “chattier” version of Big Mac where every word is carefully chosen to pack the biggest punch possible over the version we’ll ultimately get in future episodes, but you know what, he’s still a cool character nonetheless. And speaking of random (were we speaking of random? Oh wait, this next thing is about Pinkie, so the random seeped backward into the last paragraph without us even noticing), Pinkie was totally set to 11 this episode. 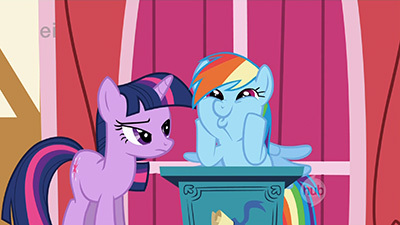 But did you catch the line where Rainbow Dash said she hadn’t seen Applejack in a week? Given that we already know Pinkie can procure a party peculiarly punctually, one could conclude that this party took an entire week to set up. Perhaps Pinkie Pie’s prompt party planning prowess isn’t particularly practiced at the present point in the series progression? Either that or they all just sat around for a week, and Pinkie made the party materialize just seven minutes prior to that scene. While this contraption was never made into official merchandise, it sure did make for a pretty awesome video. Tessa, you’ll be happy — or maybe disgusted — to know that I partook in the consumption of “for reals” Baked Bads during a brony meetup (actually, it was the same one for which I linked to a picture back in the Episode 2 deconstruction). They were… well, edible and interesting, but I stopped at two. Or maybe it was three, since nobody else was eating them and I’m not one to let food go to waste. At least they didn’t cause the entire town to go green in the face! In case you ever missed why this particular grey mare is always portrayed as being obsessed with muffins in the fanverse, here you go. I do appreciate how, even after being such a silly pony for so long, Applejack finally realizes that it’s okay to ask for help, and, perhaps more important, her friends were right there to help despite having sustained bodily harm, gastrointestinal catastrophe, or bunny-induced panic as a direct result of AJ letting her stubbornness make her go completely out of control. My only regret is that she seems to constantly forget that her stubbornness is such an Achilles heel… but I suppose that’s what makes her who she is. 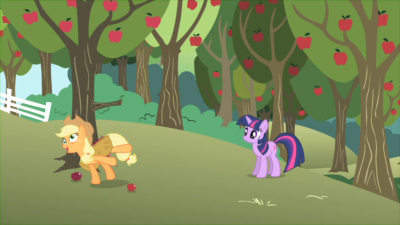 It’s also worth mentioning that when Applejack bucks trees, the apples all fall right into the basket (at least when she’s not 99% asleep, anyway), whereas when Rainbow Dash bucks a tree in the final scene several of the apples don’t make it in. The mechanics of somehow getting all the apples into the baskets clearly take years of practice to get just right; AJ’s got it down solid, so much so that even when she’s tired she can usually get most of them in. That the production team gave this some thought and deliberately (at least, I’m pretty sure it was deliberate) made a few of the apples from Dashie’s less experienced kick miss their mark is testament to the care that went into this show. And while it would be great if you could kindness apples into your baskets, I’m sure Fluttershy was actually enlisting the help of some woodland creatures to help her with her batch! Okay Twilight, now you’re just showing off. Whelp, scratch what I said about Twilight’s teleportation taking a long time to master: apparently she’s a pro at that now. Oh, and she can also lift apples off an entire orchard’s worth of trees in one go. That escalated a lot faster than I remember. The magic, not the apples. 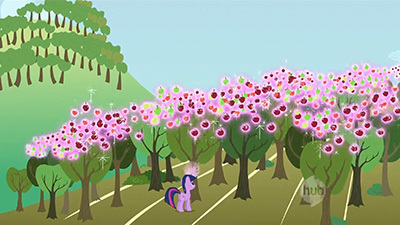 And what better song to summarize this episode with than Applejack Bucks 400 Appletrees by Foozogz. We don’t actually get to see Applejack going after the trees when she’s at 100%, but I imagine something high-energy like this would be playing in the background of the video montage where she’s showing those trees who’s boss. Buuuuuuuut, it really didn’t click with me, for many reasons the others have brought up, and left me largely uninvested in the whole affair. Mostly, it’s Applejack herself and her brick wall of stubbornness. It’s not even about asking for help, which she clearly needs, but letting a friend help when they come to you. She herself is on the other side of this multiple times throughout the episode, even forcing her help on them at times when they’re uncertain or the situation is starting to get out of hand (poor Fluttershy), and she not only refuses to afford them the same courtesy she insists on, but chews out Twilight every time the issue comes up. She’s being rude and causing a whole string of negative consequences for everyone, and refuses to accept responsibility for any of it. Even in the end when she finally admits she needs help and the others dive in, where were the apologies for how she poisoned half the town and led to a potential agricultural disaster in their parks and gardens? She learns a lesson, but it’s not enough of a resolution for how abrasive and destructive she truly was, and so doesn’t sit well with me, nor makes up for how aggravating it was to go through chains of repeated cause and effect leading up to it. Also, the fact that she receives blows to the head, leading to hearing loss and impaired vision, beyond what you’d get from just sleep deprivation, is never really dealt with, and they need to get her to a hospital STAT. If you’re going to show the consequences of head injuries to children, you also need to teach them how to properly get a concussion checked out and cared for, instead of the character just ignoring it until it goes away. You may think I’m joking here, but I’m not. This is irresponsible writing, and gave a wincing undercurrent of bad taste to a number of the gags. I will say that I do still like the idea of what Applejack is going through, that she’s in a home and business where she’s had all these responsibilities and expectations heaped on her, and has fought so hard to be strong so as to help and protect her family that she’s become almost paranoid of appearing weak or failing. That’s good stuff, but because the show is refusing to get into any of it beyond faint suggestions ultimately weakens it and doesn’t allow it any weight. As Tessa indicated, there’s obviously a story there regarding the loss of her parents, but I’m really disappointed to learn an explanation never comes up over the next four years. As with the sudden course correction during the two-part pilot, you can see there’s a lot of intelligent thought and creativity going into this series, but they’re being held back, they’re (no pun intended) being reined in from sinking their teeth into anything potentially challenging or weighty because someone higher up just wants it to be magic and rainbows and sunshine. I’m not saying go in and grit it all up, but using the show to occasionally acknowledge more serious issues would actually give much more meaning to the bright positivity friends find when they stick together and are there for one another. Applejack actually opening up about what her home life is like without her parents and the struggles she’s gone through would have made this episode entirely worthwhile, but by refusing to even bring their toe near that line, they strip the events of reason, just making it silliness driven by aggravated stubbornness. And as for worldbuilding, yeah, I caught the cows and mules speaking with anthropomorphized sapiency as well, which begs the question of why there isn’t more diversity in Ponyville. I’m not saying full segregation is in effect, but beyond Spike and the occasional wanderer in (why is the mule just there on a family farm? and correct me if I’m wrong, wasn’t the waiter in the last episode something non-equine?) we see a division among the populace. 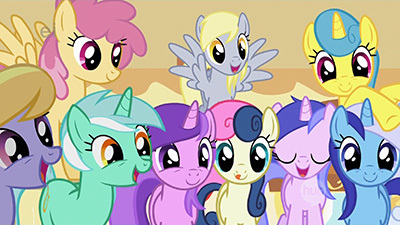 With the cows especially, there’s an almost mocking quality to how it’s revealed they went into a full stampede over seeing a snake, and they’re quickly shooed away from Ponyville and reprimanded for going near it. This again has somewhat disturbing implications which undercut what’s meant to be an otherwise humorous bit. This episode feels like the product of indecision, that they’re still settling into the show they were told they had to make after having the show they intended to make taken away from them, and are now falling victim to world elements that are being thrown in without being properly thought out, or juggling aspects that feel like they were intended to have weight but have since been stripped of any. Instead of settling into the fun shenanigans of the town myself, I’m actually being put off because I’m more clearly seeing the ropes binding it from being the richer series it could have been as they focus squarely on “dumbing it down” for a young audience, who, if they were asked, would probably prefer it when a fun show has a little more going on beneath the surface. I know I did as a kid. I’m aware Lauren Faust stepped down as executive producer and head of the show after this first season, and I wonder how much of this, aiming for something bigger only to constantly be held back, is the reason why. I think it says a lot that the only three episodes of the show she wrote this year were all grouped at the beginning, and even the last of them she only wrote half of with someone else coming in to pad out the rest. It feels like the show has gone so completely away from what it initially set out to be that I can understand passion for working on it being lost as other hands move in and figure out their own way to take over. I’ll probably be told I should just ignore all this and go along with the goofy ride of bunnies and comically icky cupcakes and Pinkie Pie bounces, but I’m not going to. I’m sure things will settle down as we get further in and the creators become more comfortable with the new format and direction, and start catering to it better than they are here, but at this point in the series, it’s broken. Like Applejack, it’s functioning, but it’s stubbornly masking its issues instead of being honest and trying to work out a way to best treat them. Seriously, it needs to go to a hospital and get an MRI, because concussions are no joke. Just a quick heads up before we close that we’ll be taking next week off while Tessa and Gerf hit Bronycon. Have fun! Wow, had I known this episode was going to wind up being so controversial, I would have put more effort into being coherent in my own write-up in order to give it a better defense (odd that this winds up being the first I go to bat for like this since I really don’t feel that strongly about it. Well, practice for when I inevitably wind up doing the same for EG down the road). I will say that I do understand where you guys are both coming from in finding Applejack’s stubbornness and destructive behavior frustrating, although I still come down on the side of finding it perfectly justified. It’s worth pointing out that prior to events really kicking off in this episode, she’s already had a week of overwork and presumably very little sleep, so right out the gate she’s starting fairly impaired. Also having gone somewhat unmentioned (to be fair, I flubbed hard at articulating it in my bit) is that at least in my opinion, the moral at play here is actually pretty well handled. The episode is approaching it from two ends, making very sure not to downplay Applejack’s hard work ethic and play it as anything but a positive, but also to stress home the point that it’s okay to get a helping hand from your friends to make it that final lap and cross the finish line. It’s a lesson both in being capable and in being okay with asking for help, and that’s not something often put forward as a lesson in girls television. Also, calling hypocrisy on Applejack is kind of really unfair in the situation. If she were forcing her aid on others without being requested, then sure, but all three cases of her “help” to the others were things they were asking her to do that she simply failed to say no to (interestingly enough, in reverse order from what was arguably more important, with poor Fluttershy unfortunately getting the short end of the stick as she gets Applejack at the tail end of the whole thing when she’s at her absolute worst, while Rainbow Dash got a loopy and less-than-competent but still pleasant enough Applejack helping her with something largely unimportant overall). It’s stacking things up more towards the end moral, because that’s part of who Applejack has always been and what she values in herself, her reliability and the keeping of her word when she offers her assistance. Likely the requests for help came before her added workload wound up falling on her, and she simply refused to turn around and tell the others that she couldn’t hold to what she promised (especially right after the town throws her a celebration specifically for her reliability for any of them to call on her). Going to come right out and say it, I disagree very strongly with Noel about his take on the parental bit. Not only would diving into Applejack’s family situation have wound up being a massive distraction from the actual moral, I actually really respect the series for having something like that be a subtle and important background element to AJ’s character without ever feeling the need to smack us over the head with it in exposition. Not to mention that as I said in my own write-up, the writers (yes, Faust included) didn’t even know for sure at this point what the deal with her parents was yet, just that there was a conscious decision for them to be absent. This wasn’t the case of them wanting to have an episode about AJ’s family situation and being forced not to, I seriously doubt it was ever the intention for it to come up specifically here, if only because they weren’t sure what they were doing with it yet. I also want to pull way back on something I said a few episodes ago, because I think it’s being far too read into for something that I honestly don’t know the details on. All I know is that at one point, the series was envisioned as a full adventure arc and then stuff changed gears. There’s been a lot of assumptions made that the reason for that landed squarely on executive meddling, and we’ve had this picture painted now of the writers wanting badly to do something else but being forced to write these last two episodes, which I don’t actually think is accurate at all. Executive meddling did eventually wind up pushing Faust away from the project, but this early on aside from several hard mandates she actually had a lot of leeway for how she could run the show and the decisions she could make (the loss of that going into Season 2 and probably specifically the forced re-working of a certain character that shows up at the end of it are more likely where the final straws wound up falling into place, as a lot of that happened as the first season was wrapping up, unless I’m mistaken). I’m also at something of a loss for words about the reaction to the physical comedy at play in this episode. I kind of hate being the one to pull out this line of thought, but, uh, it is a show about candy colored cartoon horses, after all, and one that does lean heavily on Looney Tunes style slapstick for a decent portion of its physical comedy. 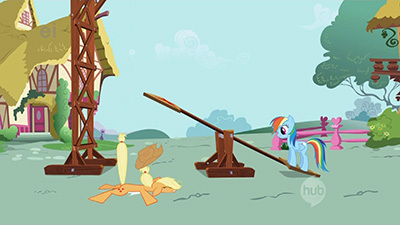 If we’re already taking issue with ponies taking blows and not treating it seriously, then we might be in big trouble, because that’s not something that ever goes away (and is one of the things I enjoy about the series, but I’m also a fan of slapstick). If you’re looking for realistic lasting consequences for physical trauma, then crappy as it is to say, you might fare better with another series. Maybe we can take some side trips to Hinamizawa between seasons to scratch that particular itch. Also, to toss out a quick answer, no, the waiter was not non-equine last episode, and the mule being there randomly is just there to be funny (apparently a miss for the others, but the joke always hit for me). I feel weird sort of playing the MST3K defense for some of this here, because arguably the whole point of this project was to look at things somewhat critically, but I’m getting a little worried that maybe the pendulum is swinging a touch too far into the serious direction at this point, and that we might be looking for the series to be something that it isn’t. Hopefully I’m wrong and this is just one of probably several cases of an episode being a hit for one of us and a miss for the other two (which I’m sure will happen several times during the course of this project). Just to state up front, Tessa and I had a nice DM conversation about some of this, so I hope she doesn’t take is as additional hammering by my repeating a few points here for the benefit of the readers. I stand by a lot of my criticism of the episode, but I’ll admit I took it a bit far at times. I actually went in expecting fun times, yet was just so frustrated by aspects hooking sour notes into me which quickly spread deep, and while the frustration I expressed in my piece is sincere, it is a bit venty. You’re right that I am going too far with the hypocrisy charge, and that I’m speculating way more than I should about the behind the scenes goings on, as you two, as fans, are far more familiar with actual production details than I am. It doesn’t change that the shift in the show is still sitting poorly with me, and I do still argue it’s suspect that Faust, for her purported amount of control and freedom over the show, still only wrote 2.5 episodes all grouped up front, without no other writing credit for the remainder of the season, but I’ll move on and keep my guesswork to myself. It’s become a bit of a habit for me over at the Showcase where details of the making of shows are hard to come by, but such is not the case here, and I’ll respect that. I’m not backing down from all my criticisms. I think we’re just coming at it from two different sides, and that’s fine. We’re allowed to see the show differently. Regardless of how deeply they wish to explore her back story, I still think there needed to me more to Applejack’s moral lesson than accepting help and handing out juice bottles. There was an entire medical tent full of people she legitimately hurt, and we never see the full level of damage caused by the rabbit horde, yet they and any repercussions are never brought up again. It’s too easy of a resolution to the episode for how far they pushed it, so either they should have strengthened the resolution, or just pulled back on the build up. Not to dive into speculation again, but we know the last episode started as a half-length short which was padded out to a half-hour. Do we know if such was the case here? It would actually explain a lot. As for the head trauma, my sister is severely handicapped as the result of a closed head brain injury, so that is something I’m very sensitive to and will stick to my criticism of it in this case. I have no issue with slapstick humor, at all. What bothers me is giving her the lingering symptoms of a genuine concussion – impaired vision and hearing loss – and making that the base of several gag sequences over a distressing stretch of time for her, and then just brushing it away with no resolution. They were the ones who chose to take it that far, which they shouldn’t have done if they weren’t willing to go all the way, so I stand by my use of the word “irresponsible”.